The first stop on my nine city tour of Europe, was Cologne in Northern Germany. 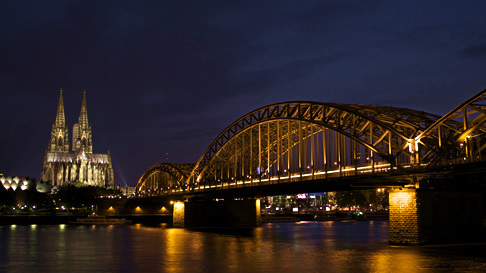 Cologne is Germany’s forth largest city, yet you’d never guess given its small town feel. I only had one day to spend here, so most of my time was spent in the immediate vicinity of the Cathedral and an area north of the Hohenzollern bridge. This bridge has become somewhat of an attraction in itself, as couples have recently begun attaching padlocks to it as a sign of their affection for each other. This is already quite a sight, and I’m sure even more so as more are added. The Kölner Dom (Cologne Cathredal) dominates the city, and climbing the 509 steps was certainly the highlight of my time in the city. I was surprised to find a small office located at the top of the spire, where a guard keeps watch over everybody as they walk around and admire the city and the surrounding region from one of the two 320 feet high spires. Is this perhaps the weirdest job in all Europe? The second half of my day was spent walking around the grounds of the Rheinpark, on the right bank of the River Rhine. Around the gardens, signs combine photos of the park as it was during the 1957 Federal Garden Show with a viewfinder onto the park as it is today. A few of the buildings seem to have fallen into slight disrepair, yet the sculptures and water features remain, giving the park a distinct retro quality. I headed back towards the city center via a cable car that crosses the Rhine, an experience that had me clinging tightly to my seat! I ended this first day in Germany as would befit this beer loving nation, washing down a large Bratwurst sausage with the local tipple, Gallen Kölsch. This may become a favourite beer should I be able to find an importer in the UK. All in all, Cologne provided a welcoming start to my trip, and even though the weather wasn’t out to impress, I still enjoyed my day exploring just a small part of this impressive city. As predicted, I was unable to blog during my travels across Europe last month, although less predictable was this being due to the death of my laptop mid-trip. I’ll be posting reports and photos from the cities I visited over the coming weeks, but here are a few general thoughts to start off with.